Here's one of my new paintings. It was done up in Edward Hopper's bedroom in Nyack, New York. 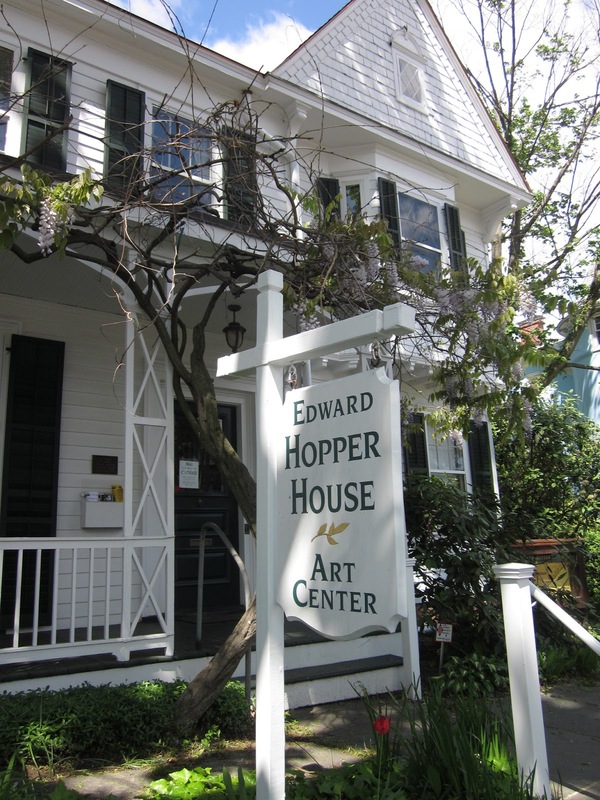 Hopper's former boyhood home is now the Edward Hopper House Art Center. Last spring and summer I made two separate trips to Nyack to draw and paint in the house where Hopper was born and came of age. I've written several times about how central to Hopper's painting the rooms and windows of this house would become throughout the artist's entire career. Why Do I Show Artists From the Past? 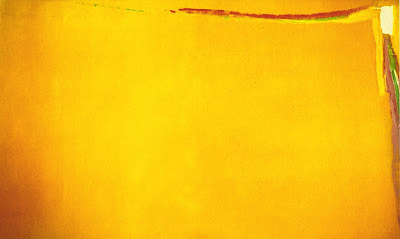 This is a painting by one of the artists I used to look at a lot when I first began painting (Jules Olitski, 1922-2007). I didn't have to look far because this is what my art professors were showing us students. And to this day I think it was a good beginning. The Olitski painting above washes over you with boldness and energy like a warm ocean wave. Of courseart is about now. It's about your experience in this moment. 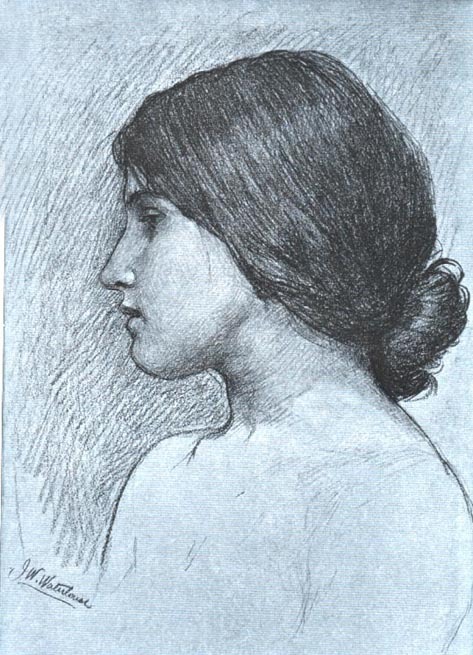 Over time prevailing styles in painting change partly because every generation sees a little differently. After I'd painted for only a couple of years I began to hear the whispers artists from the past sounding a little louder. What they were saying with their work started to echo how I was feeling. A thousand years ago in the Fall of 1966 I was bitten by this dragon. Sort of. I was in my first semester of my Freshman year at Oberlin College and was enrolled in Art History 101. It was a perplexing time- I had come to college knowing I was meant to be a sociologist or an historian. Something had gone badly awry. To my surprise and consternation, the art history survey class was the only class I was enjoying. This wasn't supposed to happen. To get to the art history class I had walk through the Allen Memorial Art Museum's courtyard. 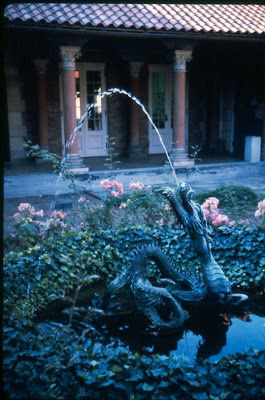 In the middle of it was this dragon fountain happily bubbling away surrounded by decorative plantings. It was an oasis of calm in the tumultuous first few weeks of school, but beyond that I gave the serpentine critter little thought. Here's Allen Memorial Art Museum (pretty classy place). My first couple of years studying art were pretty confusing. Mostly I stumbled through a long series of colorful abstractions but felt they weren't leading me anywhere I wanted to go. I was lost. Then Edward Hopper tapped me on the shoulder and said "Come this way." As regular readers of this blog know, it was Hopper who was the major influence on my career as an artist. I never met the man but seeing the brilliance in the sunlight his paintings evoked was enough for me. I dropped my abstractions and set off working in a realist direction over four decades ago. Never looked back. 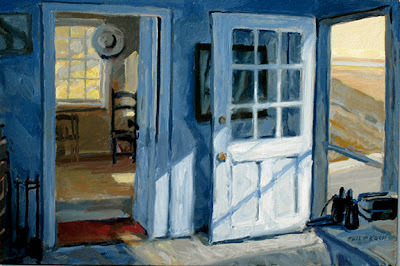 Isalos Fine Art in Stonington, Maine has just set the dates for their summer show of my work for August 13 through September 2, 2013. 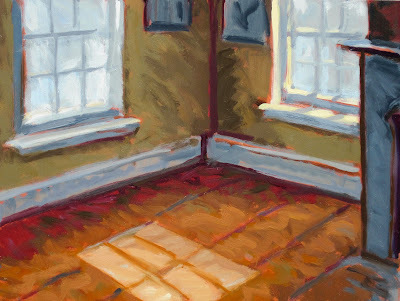 It will include paintings I've done of the interior spaces where the famous American realist Edward Hopper spent much of his life. 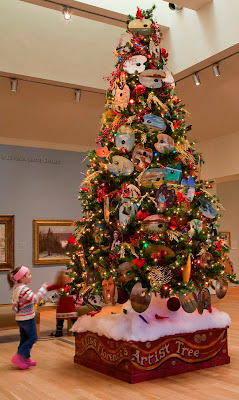 Two weeks ago I was asked by David Rau of the Florence Griswold Museum in Old Lyme, CT to be part of a holiday tradition at the museum. 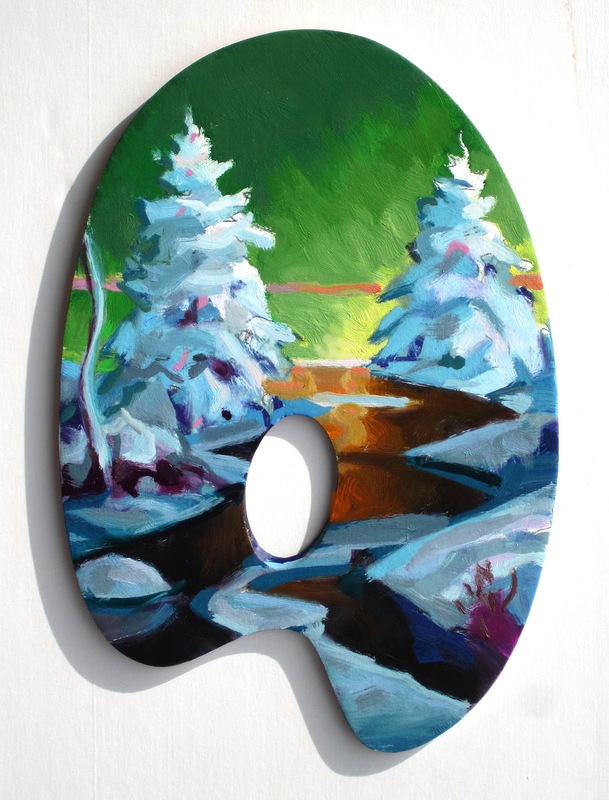 As a tip of the hat to the painters who made the Griswold famous as the original home of American Impressionism, for the last ten years they've invited artists to make small paintings on wooden artist's palettes that they hang on a holiday tree in the Museum. My wife Alice and I had visited the Griswold in March to see their current Arthur Heming exhibition. 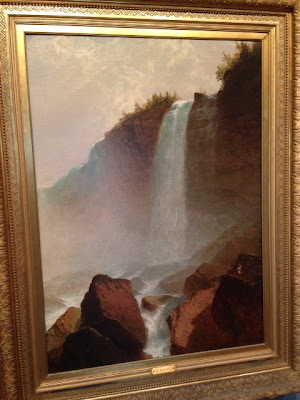 We loved the show and felt we were time traveling when we went through the older part of the Museum, the mansion house that housed the painters who made up the Old Lyme Art Colony. I wrote about that visit in an earlier blog post. 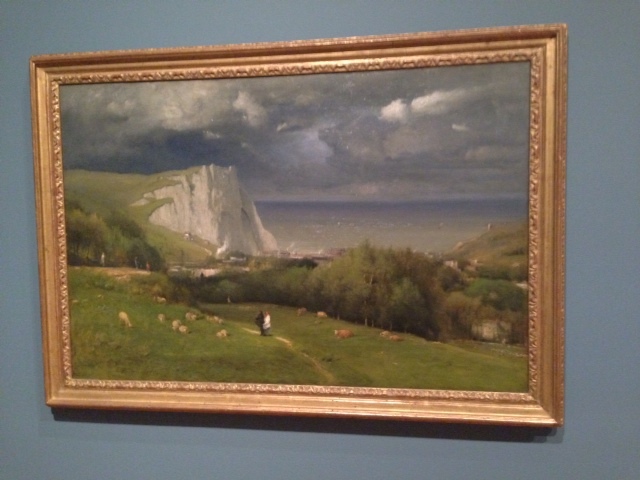 Late last month we visited galleries and art museums in Connecticut, seeing the Art Essex Gallery in Essex, (which carries quite a bit of my own paintings), the Florence Griswold Museum in Old Lyme, Yale University Art Gallery in New Haven, and finishing up with the first public art museum in the US, the Wadsworth Atheneum in Harford. By the way, I love that charmingly antiquated name "Atheneum." If you're going to be the first, you might as well stand out with an exotic name too.